Guys. My love for this book is deep. I can't stand to think there might be someone who won't have a copy. I cannot wait for this! Thanks for the giveaway chance. I'm totally intrigued at Oceans Eleveness. Ooooh, romancES, huh? I'm ridiculously excited for this book! I need it to be in my life. Great review! Dang, now I REALLY need this one. So glad to see that you loved it!! Wasn't it AMAZING???? Thank you for summing it up so well! I am so excited for this book!! I can't wait to get back into this work. The arc boxes were sooooo awesome I wish I could get my hands on one. Thanks for the chance to read this beauty!! Thanks!! I hope you love it! YAAASSS!!! Isn't she a genius?? It was magic!! Thanks Jenn!! Yeah! It was really fantastic to see multiple relationships form. And they were all so good in different ways. Yeah, the Grisha books are fabulous also, but I think this one is even better. I hope you love them! Yes, the boxes were so special and fabulous! Macmillan does such a great job! I hope you love the book! Good luck! KRISTA THIS BOOK SOUNDS SO GOOD!!!! Thanks for this review, you've definitely got me interested! As if I wan't already dying to get my paws on a copy, hearing more delicious details and gushing love for it is almost TOO MUCH! Aaaah! I'm so excited to read this! I loved the Grisha World from the first series, and can't wait to see what new adventures are in store for us next! Yessss! Love the world building. And how utterly unputdownable her books are! I loved the Grisha trilogy -- so excited that it sounds like sh'e definitely still on a rolll! 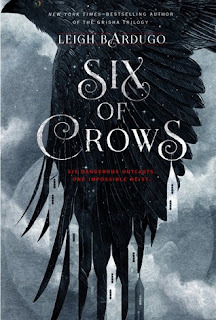 I'm so glad you liked "Six of Crows"! I haven't finished the Grisha trilogy yet, but I like it already and now I want to read this book! Great review! It sounds amazing! I'm hearing great buzz about this book. Thanks for the lovely review! Wow! As if I didn't already need this, thank God the release isn't that far. I love reading about the interactions and banter between a group of characters and I know this is going to be perfect. Thanks for the review. I would cherish it so hard! I'm SOOOO excited for this!!! Oh wow! This sounds totally amazing! I can't wait for it to come out! I love that it is an Oceans Eleven type heist story too. Can't wait for this book !!!! Ok, based on your review, I'm definitely looking out for this one! Thanks! What a great review! Thank you sonmuch for sharing your thoughts about this book! Now, I can't wait to have my oqn copy and read ot! I have only heard awesome things, I can't wait for it to come out! I have been patiently waiting to read this book! Ugh, I can't WAIT for this book!! Leigh Bardugo is a goddesss!!! I NEED to read this! I LOVED the Siege and Storm series!